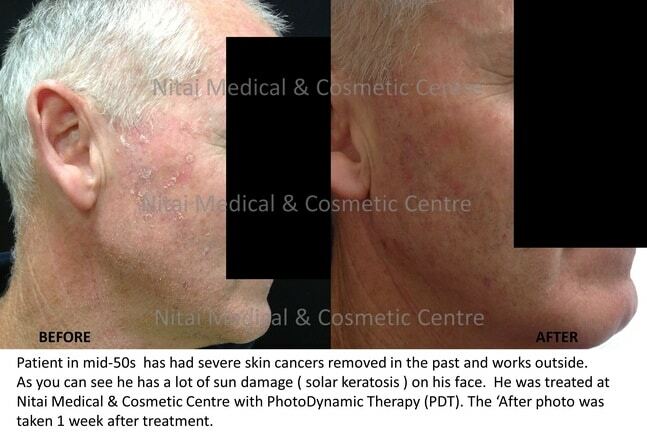 Welcome to Nitai Medical & Cosmetic Centre that offers the most effective photodynamic therapy, Melbourne. Photodynamic is an effective way of treating superficial skin cancers, sun damage, and acne. The process involves using a natural photosensitizing agent like porphyrin to stain these structures. This is known to become toxic to the affected cells when exposed to laser and light. Pure coloured (red, green, blue and yellow) light, daylight or laser would then accurately and safely penetrate the skin for destroying the target tissue. Any Risks are well understood. The best thing about this treatment is that the tissues around the affected area remain intact and unharmed. Why Is Photodynamic Therapy Used? Photodynamic therapy is non-invasive technology that is used by doctors all over the world for treating precancerous lesions, skin cancer, aged and sun damaged skin. This procedure is all about activating a light-sensitive medication that is used for treating skin cancer, Rosacea, acne etc. This procedure is also effective in the treatment of solar keratosis, a pre-cancerous skin issue. You could come to Nitai Medical and Cosmetic Centre as it is known to specialize in Photodynamic Therapy. Our brilliant medical team offers the highest level of patient care and expertise. Dr. Shobhna Singh supervises the procedure for optimum outcome and safety. Photodynamic therapy is recommended for treating superficial basal cell carcinomas, Bowens Disease, and even nodular basal cell carcinomas. Photodynamic therapy happens to be quite a new procedure that is being effectively used in the treatment of pre-cancerous, cancerous skin lesions and even acne. 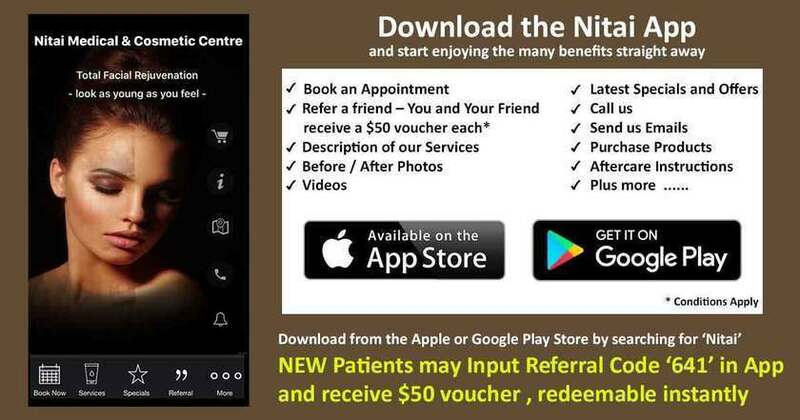 Nitai Medical & Cosmetic Centre offers the best Photodynamic Therapy in Melbourne that is effective in treating both the individual lesions, and also the field treatment anywhere in the body, for instance, legs, arms, full face, hands, scalp, feet, and décolletage. This revolutionary modality involves the effective use of a special photosensitizing lotion (5 ALA) that is applied carefully to the damaged or abnormal skin. Once the lotion has been absorbed the doctor uses a customized light source and illuminates it onto the patch of skin that has been treated with the lotion already. This process is known to cause a photochemical reaction that would be destroying metabolically all the active abnormal cells leaving the normal cells practically untouched. The process requires minimal patient downtime. The procedure is very popular today in the field of cosmetology because it leads to outstanding cosmetic results. It usually necessitates a couple of treatments about two weeks apart. Patients come for an evaluation by the concerned doctor after two or three months post the photodynamic therapy at our clinic in Melbourne. Fast healing with no to negligible damage to the healthy cells. It does not lead to scarring. The skin recovers rapidly. It looks healthy, radiant and smooth. The absence of anysystemic reaction. The treatment is safe (with well understood risk profile) and effective for all kinds of skin and all skin colours. This procedure could be recommended to patients belonging to all age groups. The treatment could be customized as per individual requirements and could be repeated if necessary. The procedure allows other cosmetic treatments if required in future. There is no restriction in undergoing any other cosmetic treatments if necessary in the future. The following patient came to us with a severe skin issue and our doctors treated him successfully using the versatile Photodynamic Therapy in Melbourne. The patient had a medical history of skin cancers that had been eliminated in the past. He is in his mid-fifties and as the picture reveals, he has been suffering from quite a lot of sun damage on his face. His condition is often referred to as solar keratosis. He was treated with an effective PDT or Photodynamic Therapy. You can clearly see the visible results in the After Photo that was clicked a week post the PDT at Nitai Medical & Cosmetic Centre. What Kind of Light Is Being Used? A blue-coloured wavelength light is actually used. Blue light sources are not supposed to be harmful to the skin. This is certainly not x-rays or the ultraviolet light. It, therefore, has absolutely no adverse or harmful effects on your skin. Yes, Photo Dynamic Therapy actually is a useful and a unique treatment for treating sun damaged the unhealthy skin on your body or face. This treatment is, especially, apt for those having roughened sunspots or pre-cancerous lesions. Who Is the Right Candidate for Photodynamic Therapy in Melbourne? PDT could be used practically on all kinds of skin and across all age groups. PDT could be effectively used on all body parts but the facial skin is supposed to be the commonest. PDT is not advised or recommended to pregnant women or those breastfeeding. If you are suffering from a rare condition referred to as porphyria, or have taken the medication called Roaccutane in the earlier 6 months, or have a clinical history of a condition called keloid scarring or also in the treatment of photosensitivity then avoid Photodynamic Therapy. What Could Be the Side Effects of Pdt? PDT results in making the skin extra sensitive to sunlight at least 48 hours post treatment so it is a good idea to avoid sunlight. It is mandatory under the circumstances to use sunscreens for avoiding getting sunburnt. Just after treatment is over, there could be some sort of redness including slight swelling. You would be experiencing mild sunburn. The skin might feel tight and dry, accompanied sometimes by skin peeling typically in the very first week after PDT. The treated area could be a little red for about 1-2 weeks. What Are the Amazing Benefits of Pdt? Photodynamic Therapy performed at our Melbourne clinic is a very well-tolerated treatment and involves minimal discomfort. PDT is performed quite easily at Nitai Medical & Cosmetic Centre, a highly acclaimed specialty clinic in Melbourne. When PDT is used for the treatment of acne, unlike other clinical acne treatments, it does not necessitate oral antibiotics on a long-term basis and you would not need to consume medications like Roaccutane. Most of the patients are truly delighted to see the results of this effective non-invasive procedure. Come to Nitai Medical & Cosmetic Centre if you need professional assistance and effective solution for any skin issue. Our experienced and fully certified doctor would be assessing your case and accordingly would be suggesting an appropriate course of treatment along with an ongoing skin care program suitable for your unique case.